Rescue and placement of Chihuahuas in Victoria, Australia. Please note that this dog is not available for adoption. Click here to view the doggies that are currently available for adoption. Tinka is the most stunning little long coat Chihuahua cross Pom in the colour called blue. So loving to all. She very heavily "in pup" so will be allowed to have her puppies, as she is very nearly due! An xray shows she is expecting five or six pups of unknown breeding! She is not much more than a puppy herself as she is only one year old! In the very early hours of Saturday 24th November 2012 Tinka began labour at 12.15am. 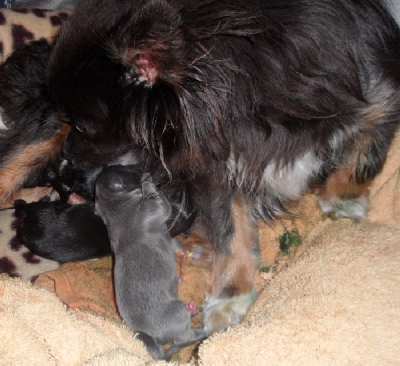 By 4.14 am she had produced six gorgeous little puppies! 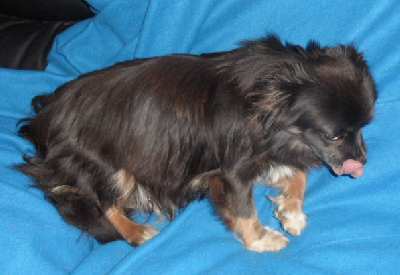 Tinka will become available for adoption approximately January 2013, and we have two interested parties. The puppies, if they survive, will become available approximately at the end of February 2013. The two girls have people on the waiting list for them. The boys, so far have two people interested. Two out and third just being born, what a wonderful little dog! Tinka has completely regained her health after many problems throughout the birth and feeding of six hungry little puppies. She was taken away from the puppies when they were three weeks of age, for her own health reasons. On Thursday 17th. January 2013 she is being desexed and microchipped. Immunization on Monday, and going to her possible new home on Wednesday! Love your dearly Tinka! We have been through some adventures together over the last three months my darling little girl! Go to Chihuahua Rescue Victoria web page. To get in touch with us, see the Contact Us web page. All of our adoptees are vet-checked, desexed, immunised and microchipped. Occasionally, we need a bit of financial assistance to pay for these veterinary procedures. If you want to apply for any of the dogs currently available, raise an Expression of Interest. 1) Give through PayPal (click the PayPal button right) or email us for bank details. Give as little or as much you feel comfortable with.